With styling unlike any other SUV in its class, the all-new 2007 Dodge Nitro will get plenty of sales on looks alone; however, more discerning buyers will likely be put off by its sloppy handling and so-so mileage. The 2007 Dodge Nitro is an all-new compact SUV tuned for street duty. Striking exterior style, functional cabin with lots of storage, good visibility, quiet ride. Most small SUVs are gentle creatures -- conservatively styled, car-based designs that aspire to deliver practicality, comfort and perhaps a touch of athleticism in an economical package. But leave it to Dodge to create a compact sport-utility that won't play nice with its peers. An all-new offering this year, the 2007 Dodge Nitro is based on a slightly lengthened version of a chassis also used for the Jeep Liberty. It's a unibody design, but a non-independent rear suspension, a standard rear-drive configuration (with four-wheel drive optional) and the use of large-displacement 3.7-liter and 4.0-liter V6 engines all point to the platform's truckish roots. Then, there's the matter of styling, as the Dodge Nitro forsakes its competitors' soft curves for a Ram truck-like grille, exaggerated fender flares and oversize tires that measure up to 20 inches in diameter, depending on which trim level you select. It's a unique look for this class, although the Nitro's high beltline and short glass area call to mind the Hummer family, while the faux vents in its front quarter panels are cribbed from Land Rover's Range Rover Sport. For those who want a small SUV with a definitively masculine presence, the new Nitro will surely do the trick. Unfortunately, there's not as much substance as style. Even though Dodge retuned the suspension to provide a sportier feel on pavement, the Nitro is ultimately unable to deliver the kind of refined ride quality and responsive handling you get with true car-based SUVs like the Mazda CX-7 and Toyota RAV4. Similarly, its V6 engines can't match the smoothness or efficiency of competitors' smaller engines (which are nearly as powerful). In its favor, the 2007 Dodge Nitro offers a roomy, comfortable cabin that's well insulated from wind and road noise, but in the highly competitive compact SUV class, this isn't enough to offset an overall subpar driving experience. 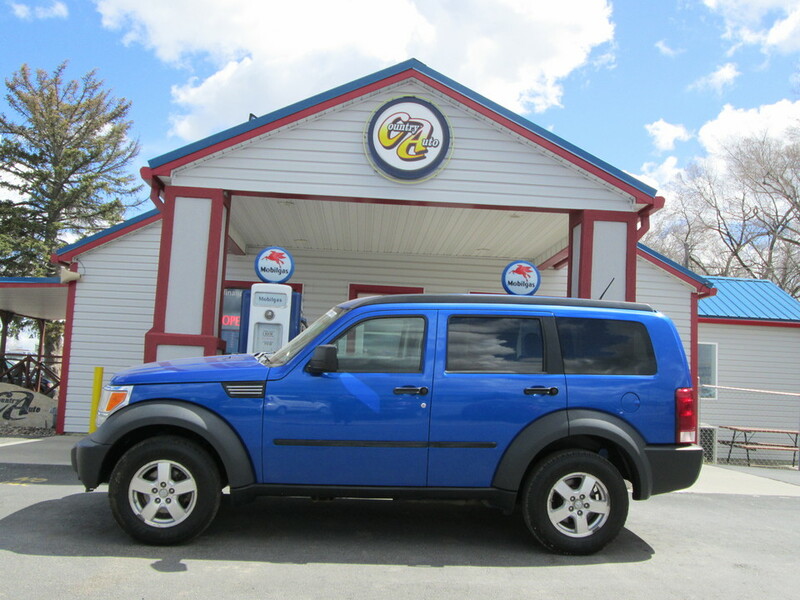 A small SUV, the 2007 Dodge Nitro is available in SXT and SLT trim levels. Standard equipment on the base SXT includes 16-inch steel wheels, a roof rack, air-conditioning, a six-speaker CD stereo, a 115-volt outlet and power windows, mirrors and locks. Step up to the Nitro SLT and you'll get 17-inch alloy wheels, body-color exterior trim, a power driver seat, cruise control, steering-wheel-mounted audio controls and a slide-out cargo floor (called Load 'n Go) with tie-down points. Available on the SLT is the R/T Package, which provides a larger engine, 20-inch chrome wheels, firmer suspension tuning, upgraded exterior trim, two-tone cloth upholstery and Sirius Satellite Radio. Major options on the Dodge Nitro include leather upholstery, a sunroof, an upgraded audio system with an in-dash CD/DVD changer, a rear entertainment system and the MyGIG multimedia system, which offers navigation, MP3 file storage/playback and Bluetooth functions via a central touchscreen. Class III towing preparation is also available. Standard on the Nitro SXT and SLT is a 3.7-liter V6 rated for 210 horsepower and 235 pound-feet of torque. A six-speed manual transmission is standard on SXT models; a four-speed automatic is optional on the SXT and standard on the SLT. The Dodge Nitro R/T alone comes with a 4.0-liter V6 engine good for 260 hp and 265 lb-ft of torque. A five-speed automatic transmission is standard with this engine. All versions of the Nitro are available with either rear-wheel drive or four-wheel drive (4WD). Nitro 4x4s have a part-time system with high- and low-range gearing. Properly equipped, the Nitro can tow up to 5,000 pounds regardless of drivetrain. Antilock disc brakes, traction control, stability control and full-length side curtain airbags are standard on the 2007 Dodge Nitro. All Nitros also come with a tire-pressure monitor; the SLT and R/T offer a readout of the tires' current psi (whereas the SXT only warns you when they're low). Inside, the Nitro has a somewhat industrial feel, though faux aluminum accents brighten the place up a bit. Materials quality is average for this class, with only a few plastics that stand out as low-grade. An upright seating position provides a good view out the front, and liberal use of soft cushioning makes it easy to get comfortable. Legroom is ample for adults in the backseat, though the bench is mounted too low for optimal comfort. There are 32.1 cubic feet of cargo space behind the rear seat. The lift-over height is high for a compact SUV, but the slide-out cargo tray in SLT and R/T models provides easier access when unloading groceries and luggage. With both the rear seats and the front-passenger seat folded, there are 75.6 cubic feet of space. Acceleration is adequate with the 3.7-liter V6, but only when equipped with the 4.0-liter engine does the 2007 Dodge Nitro feel truly quick. We've timed a Nitro R/T at 7.7 seconds for the 0-60-mph run. The Nitro cruises quietly at highway speeds; the ride is mostly comfortable as well, though soft suspension damping allows too much body motion over bumps. Handling around corners is unimpressive for a small SUV, as even the sporty R/T model exhibits slow steering and significant body roll. In keeping with the Nitro's modest handling limits, the stability control system is undefeatable and quick to intervene during aggressive maneuvers. The brake pedal has a long travel and a somewhat vague feel (typical of a trucklike vehicle), but stopping distances are convincingly short -- that same Nitro R/T tester stopped in 122 feet from 60 mph.